The 23rd Fighter Group was established during World War II as the 23rd Pursuit Group. Redesignated the 23rd Fighter Group before its activation, the group was formed in China on 4 July 1942 as a component of the China Air Task Force. At this time in time, the 1st American Volunteer Group (AVG) – the “Flying Tigers” of the Chinese Air Force was disbanded. Because of this, the 23rd FG took in several Flying Tiger under their wings. Thanks to this, the 23rd FG eventually took over the name of the group. The 23rd is still active today and are the only USAF aircraft currently authorized to carry the “FT” tail code. In tradition to their history, they still paint shark mouths onto their aircraft in remembrance of the shark mouths found on the AVG P-40’s. This article is partially based on information found at WIKIPEDIA, 25th august 2015. The decals included with this kit are probably the best I have seen so far with any Aeromaster decal sheet. Everything is provided to build at least two of the aircraft provided with the decal sheet. 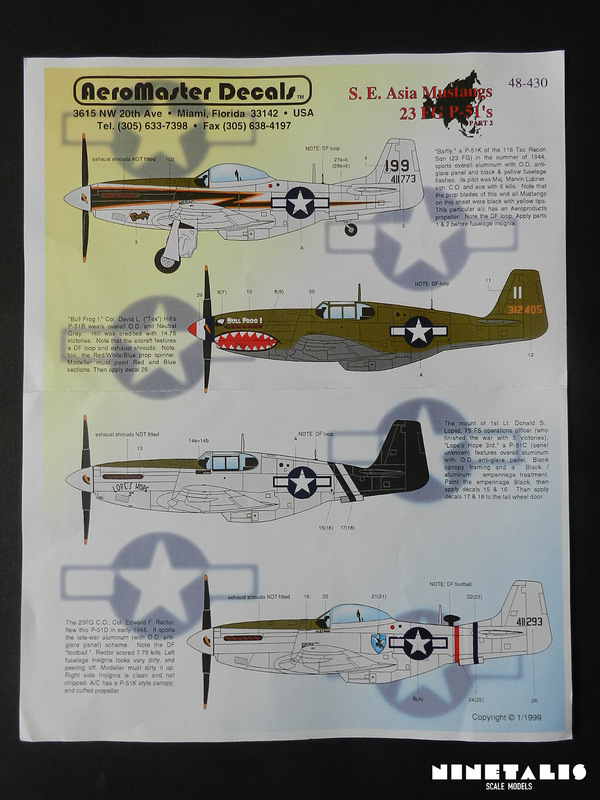 However, if you do not have USAF insignia’s to provide yourself, you are limited to building one aircraft and the P-51D of Edward F. Rector aircraft (the fourth one) as one of the decals is provided as a ‘peeled’ insignia. This should not really prove a problem as most P-51 kits have USAF insignia’s in them. Aside from this, there is also the lack of standard stencils like the propellor markings. This is a bad saddening if you consider the fact that one of the aircraft is outfitted with an Aeroproducts propeller, compared to the usual Hamilton Standard 4-blade propeller. Not to worry though, as all the ‘custom’ stencils are provided. Overall the colouring seems to be right and as with their other decal sheets. 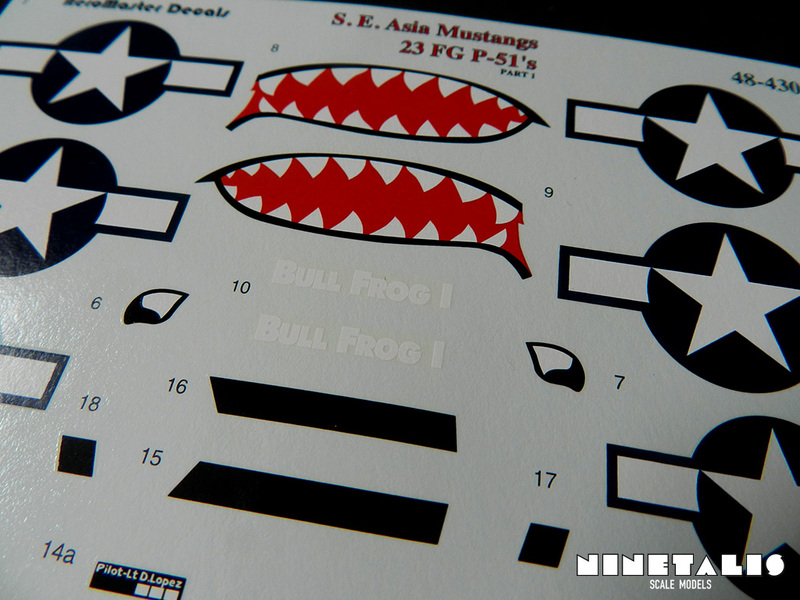 Silvering is at a minimum and when I used these decals on my Tamiya kit, they went down very smoothly, adhered very well without the use of any additional products and never gave any indication of ripping at all. In total there are four different marking schemes to choose from, with all of the pilots being aces. Each airframe is completely different from the other, so people who like to build various aircraft from a single decal sheet will be very happy when acquiring this. 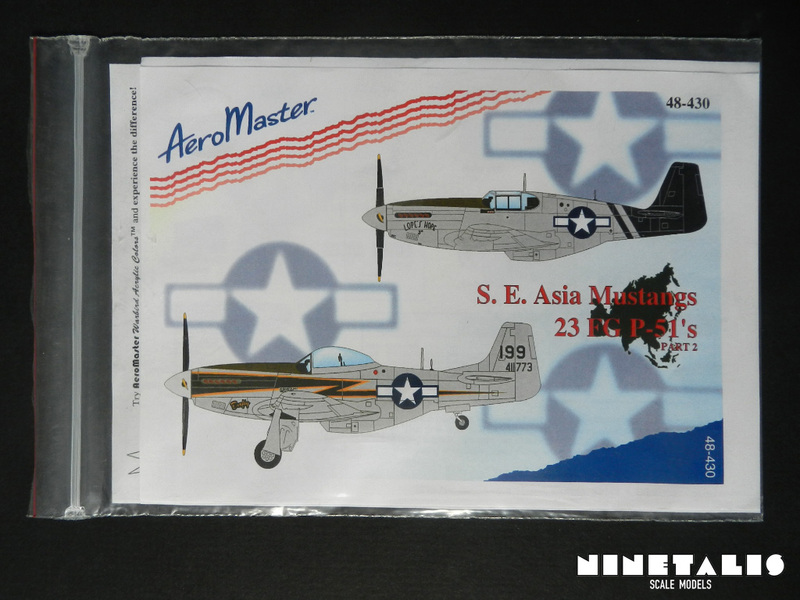 As stated on the packaging, all four of the aircraft included are P-51’s of the 23rd Fighter Group Stationed in South East Asia. 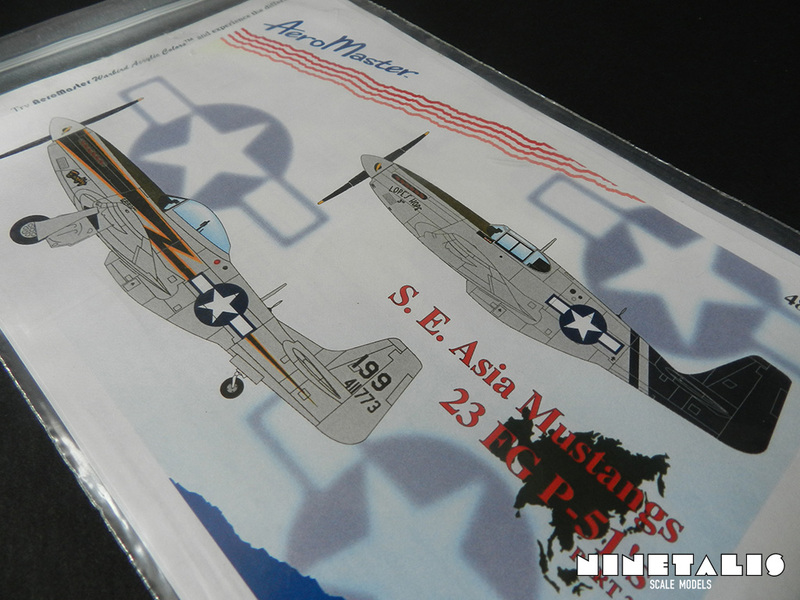 The 23rd Fighter Group was formed in China on the 4th of July 1942, inheriting the missions of the famous Flying Tigers. Receiving a number of officers and pilots from the widely-known squadron. The first is a P-51K of the 118th Tac Recon squadron. It is painted in a ‘overall aluminum finish’ with an olive drab anti-glare panel, wearing a prominent yellow-bordered black lightning bolt painted on both of the fuselage sides. The aircraft was piloted by Major Marvin Lubber, who was the squadron C.O. with 6 kills to his name. Notable details of the aircraft are the lack of the exhaust shrouds, the instalment of an Aeroproducts propellor and the DF loop on the empennage. 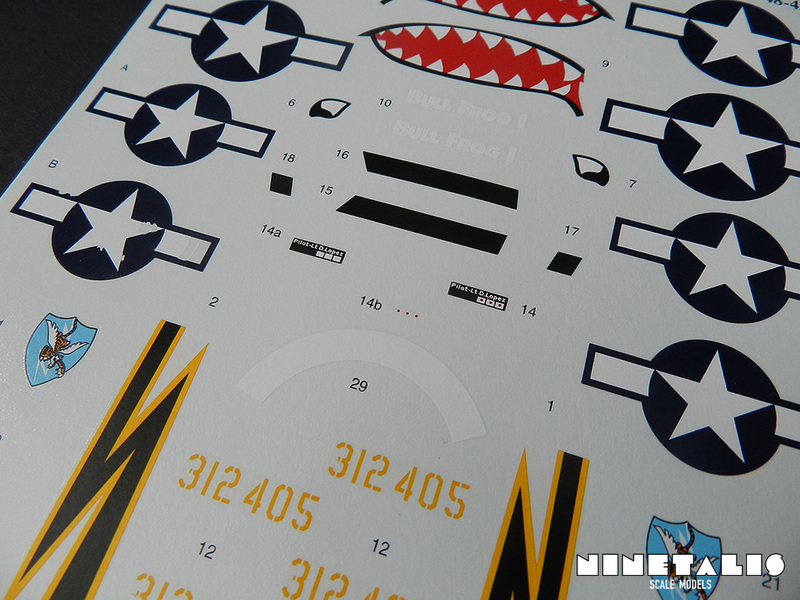 The second and third marking schemes are for a P-51B and P-51C. The first one of these is a rather famous aircraft, known as ‘Bull Frog I’. The aircraft itself is painted in Olive drab on the upper surfaces and dark grey on the lower surfaces. It sports a large shark mouth, which was a reference to the history of the AVG Flying Tigers. Notably, the spinner is also painted in a red-white-blue banner. The aircraft was piloted by the very known Colonel David L. (“Tex”) Hill, who was credited with 14.75 kills to his name. Unlike the other aircraft here, this aircraft does wear exhaust shrouds. The third aircraft is a P-51C, which is basically a P-51B with a different engine variant constructed in Dallas, Texas. This aircraft features overal aluminum panels, with the hood painted in a greenish olive drab as anti-glare panel. The tail completely painted in black, and on the nose we can find a ‘Lope’s Hope 3rd’ name art. There are also three Japanese kill marks right below the canopy framing. Although the aircraft itself isn’t as known, it was piloted by Donald S. Lopez, an ace who ended the war with five kills (four in a P-40 and one in this P-51C). After a long and successful career in the Air Force, he went on to become the assistant director for Aeronautics for the National Air and Space Museum in Washington DC, eventually becoming the deputy director of the museum. Something to note here is that I did find some photographic material showing the aircraft in question (which I can’t share here for copyright reasons), and on these photos the DF loop is clearly not installed on the empennage, despite this being stated on the paint schemes. It might be possible that it had it at one point, but it doesn’t show so on the pictures I found. The final aircraft is another P-51D, who was outfitted with a P-51K canopy, a cuffed propeller and a DF “football on the empennage. The aircraft sports the late-war aluminum scheme with an olive drab anti glare panel. On the empennage we can fin a thin red, white and blue stripe and a squadron logo in front of the fuselage insignia. According to the writer, the fuselage insignia on the right side has partially peeled off, while the insignia on the left side is not. The modeller should address this accordingly by using the right decals and dirty up the aircraft. Its pilot, Edward F. Rector with 7.75 kills to his name, flew this P-51D in early 1945. 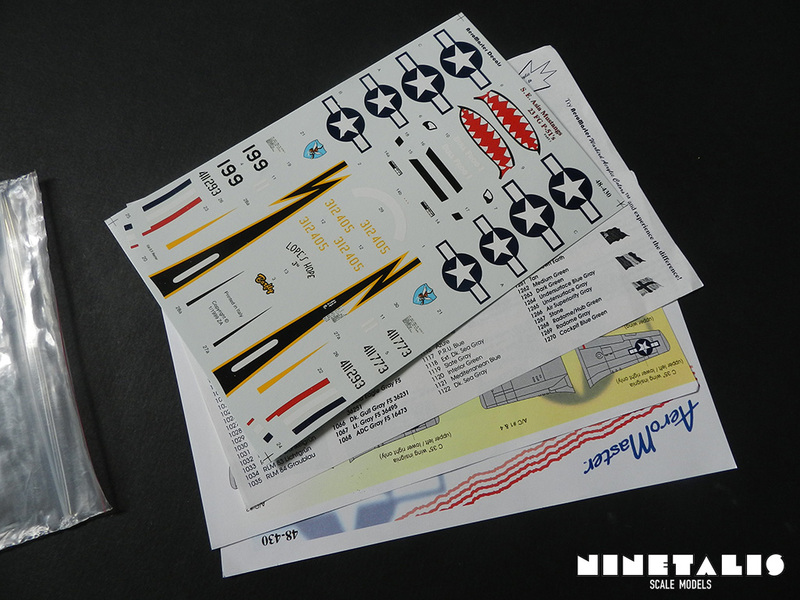 Next to the marking sheets of the provided aircraft, there are some additional sheets of paper providing information on how best to apply your decals to your model. here they explain that usually it is not needed to use any other materials to let the decals set, unless you are dealing with very rugged edges, especially in combination with matte paint. 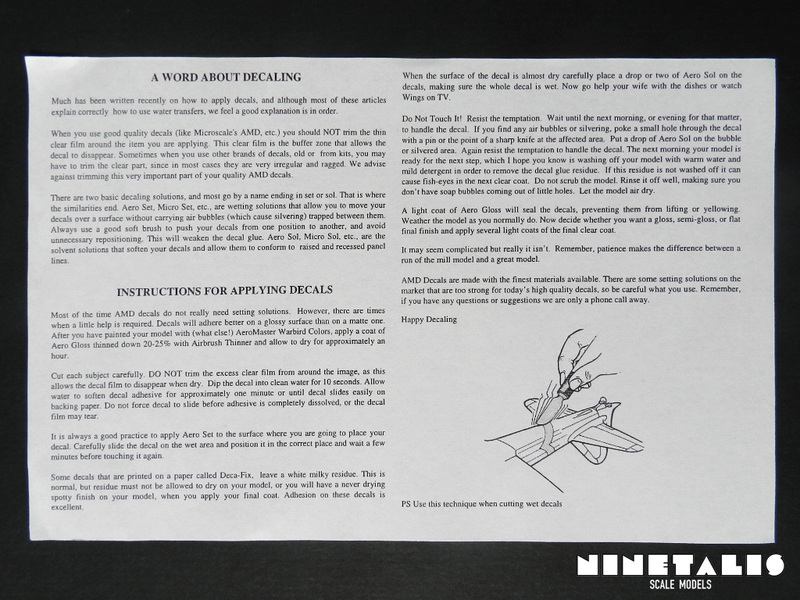 There is also a short text included on how to deal with any pockets of air beneath your applied decals. 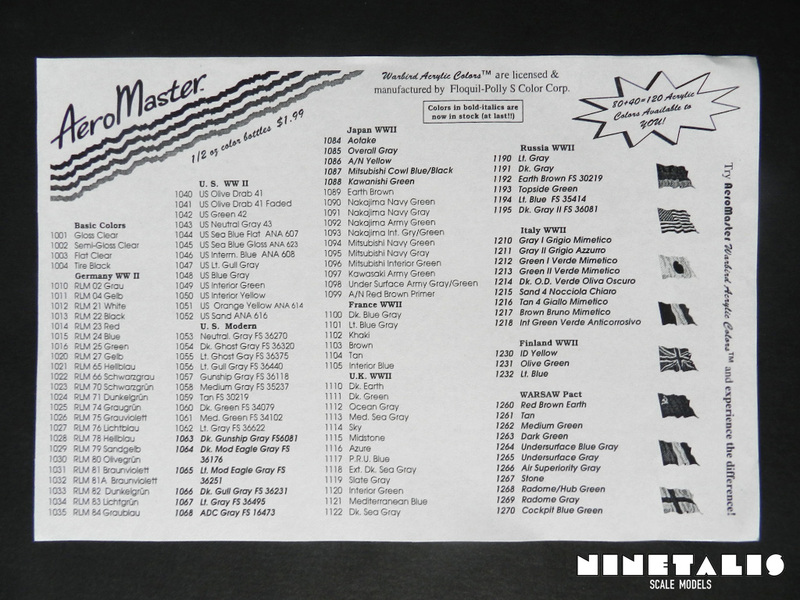 There is also another sheet of paper on Aeromasters paint colors, which you can buy with money orders. I must say that these have been one of the better decals I’ve had the pleasure to work with. I had no real problem when I was applying them to my model, and I did not need any special decal setting products. Although it was hard to find any pictures of the aircraft in question, I could not really find any real mistakes with the decals provided, which has happened before (or at least with the photographic material I could find of the given subjects). Definitely recommended. 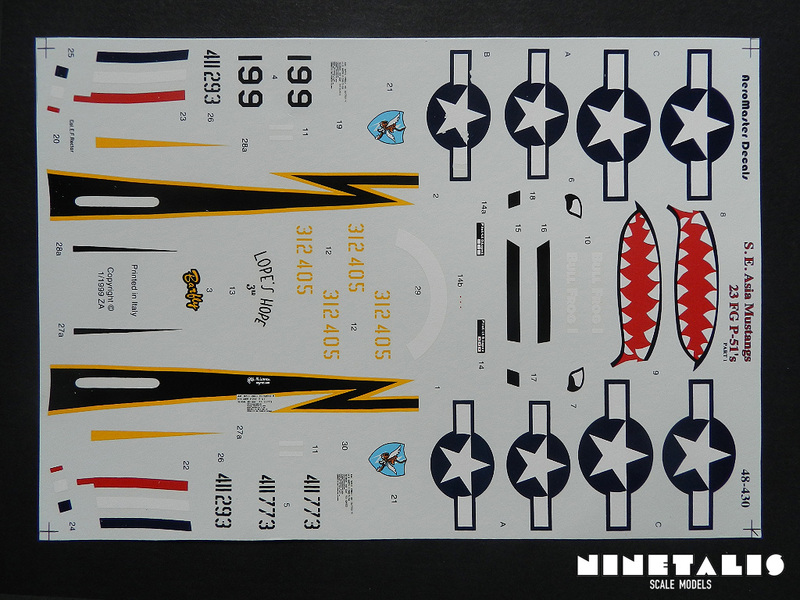 If you wish to see how the decals look on a finished model, I would gladly like to refer you to the Tamiya P-51B/C in my completed works gallery, which I painted in the colors of Donald S. Lopez “Lope’s Hope 3rd”.